Lake Arrowhead Oktoberfest has arguably one of the most beautiful settings for a beer festival . . . beautiful Lake Arrowhead! 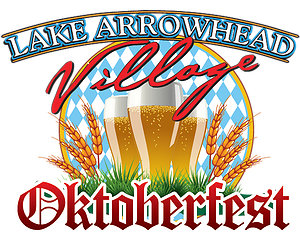 Oktoberfest is located in the “downtown” area of Lake Arrowhead Village. This Lake Arrowhead festival boasts traditional German-style Oktoberfest music, stein holding contests, dancing, a sauerkraut eating contest, and traditional German food such as bratwurst, knockwurst, sauerkraut, pretzels, and other foods from the various food vendors and local restaurants. Of course the best part about Oktoberfest in Lake Arrowhead is the BEER! Typical Oktoberfest beers that you’ll find at the Lake Arrowhead Village Oktoberfest are Spaten Oktoberfest, Spaten Optimator, Franziskaner Weissbier, and some other great beers like Stella Artois and Goose Island Pale Ale. The Lake Arrowhead Oktoberfest celebration is free to attend so you don’t need a ticket! So enjoy the music and festivities and vendors. Of course the beer isn’t free, but just purchase a commemorative 16.907oz beer mug and your first drink ticket for $20 on Saturday or $15 on Sunday, then each additional beer is just $8. For the 2015 Lake Arrowhead Oktoberfest, the festivities are on every Saturday & Sunday starting on September 19 and ending on October 25. This is one of the Lake Arrowhead Festivals that you don’t want to miss! So get yourself out of your comfortable cabin rental and head to the village!